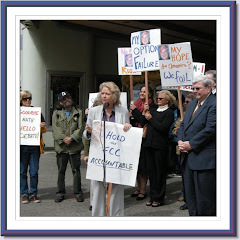 Sue Wilson Reports: Save Talk Radio! Really? I was strolling through my local county fair this summer, a small fair, a friendly fair, where cows, sheep and pigs outnumber food vendors. The Republican booth caught my eye, but not because of the red white and blue decorations. What caught my eye was the sign they'd posted, the sign that summed up the one key issue of importance to local Republicans. What would it be, in this raucous political summer of 2009? Anger over bailouts, fear over death panels? No. 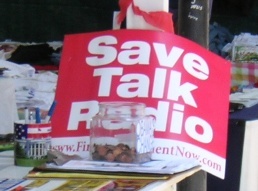 The number one issue for Amador County Republicans: "Save Talk Radio." "We hold dearly our right to freedom of speech and the right for others to express their views. We believe that Government should stand aside rather than stand in the way of the discussion of ideas. We believe that because the First Amendment should be about freedom of choice. "Therefore, we the undersigned oppose all efforts of any Government to limit, censor, or restrict in any way our unfettered right to free speech on our radios, televisions, the Internet or any other medium." "We reject any effort to institute (1) the "Fairness Doctrine" or (2) "localism", which in its various forms seeks to establish local committees of "community leaders" to determine if talk radio is "reflecting" the views of the community, or (3) a quota system for ownership of radio stations – or any variance of any of those." In other words, they advocate free speech for giant corporations, but not for local people. Hmmn. I wondered how pervasive petitions like this might be. It turns out there are many such petitions on line, promoted by groups much more familiar than "First Amendment Now." So many, in fact, that they have amassed an army of more than a half a million to silence local views. The Christian Coalition: "They want to pass what is known as the "Fairness Doctrine", which is nothing more than a way for the federal government to demand that all broadcasters must give "equal time" to all points of view." Equal time to all points of view? What a radical concept. The Family Research Council: "We need to be aware, however, that liberals may achieve their ends without passing legislation, or even without a new FCC “fairness” rule. They could do it by requiring a fixed amount of local content for radio." Local content on local airwaves? It must be a Communist plot. 1. Obama's FCC will use "localism," "diversity of media ownership" and serving the "public interest" as a backdoor "Fairness" Doctrine. 2. We must make any attempt by Obama's FCC to silence talk radio a political third rail, one that the Administration or Congress dare not touch. 3. We will defend talk radio from these governmental assaults on their industry, and build further the case for free speech in all things. "The Left dominates every medium of news delivery, save for talk radio. And they can't stand it, so they want to wipe it off the media map." The Free Speech Alliance is an arm of Brent Bozell's Media Research Center, which for years has been claiming liberal bias in the media with little evidence to back up the claim. This group has been quietly building an army to support corporate owned media and to squelch local voices. "MRC’s Free Speech Alliance -- with 69 organizations now involved -- seeks to build the largest possible grassroots Alliance army. So far, we have over 550,000 members, but we need the maximum number possible to go to war when free speech is threatened." Among the 69 groups in support are: Accuracy in Media, American Conservative Union, National Taxpayers Union, National Religious Broadcasters, Family Research Council, Focus on the Family, World Net Daily, Salem Communications, and Clear Channel. It is clear that the "right" has been quietly assembling troops and is now mounting their attack, an attack largely unanticipated by media reformers, an attack now staged on "Conservative" talk radio and TV (not that there is anything conservative about opposing localism.) Their dominance over radio, where "conservatives" outnumber "liberals" by nine to one, means their army is growing every single day, while the other side didn't even know there was going to be a fight. An army of 550,000 from County Fairs and the internet. How many more will there be as recruitment shifts to the public airwaves, currently under the private control of those who wish to keep it that way? And who will stand ready to fight back? A few months later, after the campaign from the right had kicked into full gear, charging that liberals were trying to prevent free speech on the radio, the paragraph was quietly removed from the White House website. So I ask again...who will stand ready to fight back and in favor of real free speech on our public airwaves?nd the internet. How many more will there be now that recruitment has shifted to the airwaves? And who will stand ready to fight back? It is local talk radio under attack from the national corporations that profit from Rush and the others. Your local host has been sacked and your local voice and diversity silenced.